Lady Gaga has revealed that she is working on new material with Sir Paul McCartney. The singer shared photos of the pair on her Instagram account, saying she was helping him on "one of his many secret projects". 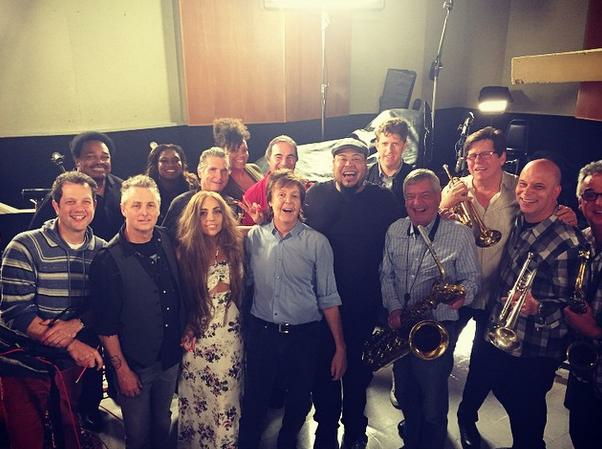 "Had a beautiful session with Sir Paul McCartney and friends," Gaga wrote. "Working on one of his many secret projects! Killer musicians, vibe, and lots of laughs." Gaga also shared that she originally hung up on the Beatles star when he asked her to work with him, as she thought it was a joke. She captioned a photo of the two of them: "Always a good time with my buddy. I'll never forget when he called me last year to work and I hung up the phone cuz I thought it was a prank!" Both artists are set to perform at this year's Grammy Awards on Sunday (February 08) – Gaga will take to the stage with crooner Tony Bennett, while McCartney will perform 'FourFiveSeconds' with Rihanna and Kanye West.